I made these crockpot potatoes dijonnaise to go with a smoked salmon spinach frittata I had planned for dinner. 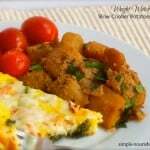 After scrounging around and finding 4 potatoes in the pantry, I went looking for a crockpot potatoes recipe. I found this recipe for CrockPot Potatoes Dijonnaise in Slow-Cooker Recipes Cookbook, a Gooseberry Patch Cookbook. While it looked good, the recipe called for 1/3 cup dijon mustard, 1/2 cup oil and 1/3 cup red wine vinegar. Not exactly Weight Watchers Friendly! I cut way back on the amount of oil, vinegar and mustard called for. I mixed together just enough to lightly coat the potatoes. One of the advantages of crock pot cooking is that you can use a lot less fat, because the moisture and flavors are retained during cooking. I also added a little rosemary seasoning blend from Pampered Chef that I love. Rod and I both really liked these CrockPot Potatoes Dijonnaise. They were delicious with the frittata. 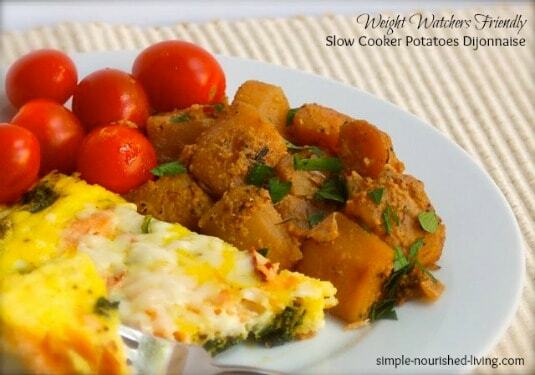 The Crock Pot Potatoes are an easy, healthy and delicious alternative to hash browns. In a medium bowl, stir together the mustard, oil and vinegar until well blended. Stir in the salt and pepper to taste. Add the potatoes and onion and stir to coat. Dump the mixture into the slow cooker. Cover and cook on low for 8 to 10 hours, or until the potatoes are tender when pierced with a fork.